LED lights illuminate merchandise at every level! 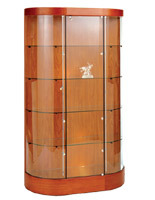 This showcase is a modern-styled curved display case. 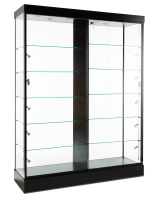 The display cabinet, showcase is a great choice for gift shops, museums, galleries, jewelry stores, retail locations and more. 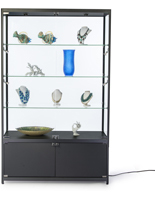 The glass display showcase can hold glass figurines, trinkets, collectibles, jewelry, and other expensive items. 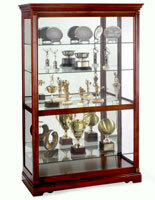 A retail store will find this showcase very useful for displaying items, while keeping them safe. In order for a customer to handle a displayed item, he or she must ask a retail sales associate to open the showcase. 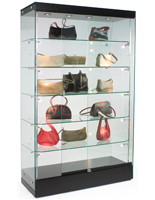 Buying a showcase can help prevent thef, saving your store money on lost profits. 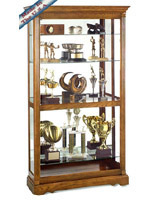 This showcase, also known as a display cabinet, has many great features. The showcase is illuminated to highlight the beauty of showcase items. Three LED lights are recessed in the top canopy, while an additional seven spotlights are suspended upon a track within the showcase, illuminating products at every level. 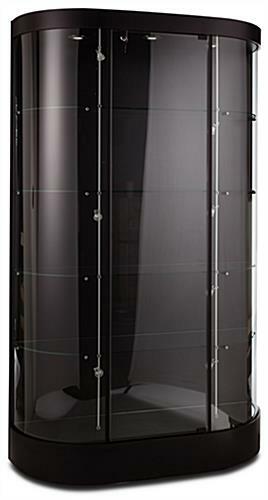 The display case features a solid back with a curved, tempered glass front. 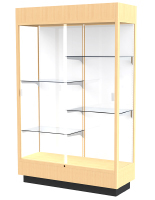 Four fixed height tempered glass display shelves provide five levels of showcase space. 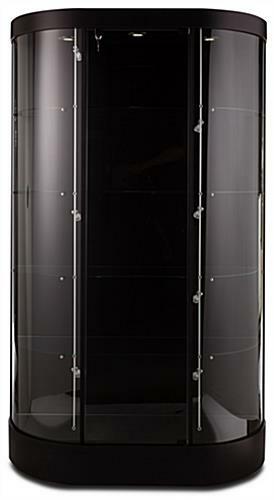 Wheels keep the showcase easily movable, while a laminated deck further highlights showcase merchandise.